Swami Satyasangananda Saraswati (Satsangi) was born 24th March 1953, in Chandorenagore, West Bengal. 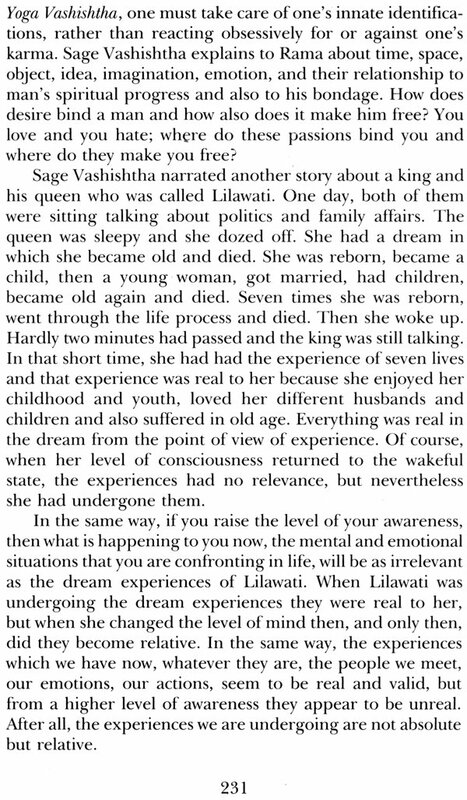 From the age of 22 she experienced a series of inner awakenings which led her to er guru, Swami Satyananda. 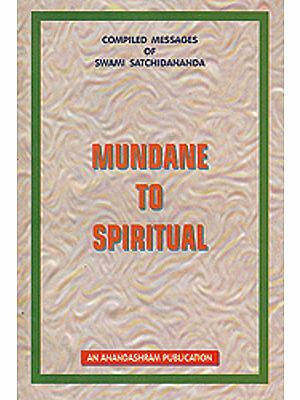 From 1981 she travelled ceaselessly with her guru in India and overseas and developed into a Scholar with deep insight into the yogic and tantric traditions as well as modern sciences and philosophies. She is an efficient channel for the transmission of her guru's teachings. The establishment of Sivananda math in rikhia is her creation and mission, and underprivileged areas. She embodies compassion with clear reason and is the foundation of her guru's vision. Karma sannyasa is a dynamic and practical way of life, enabling the individual to develop higher awareness through life rather than away from it. The concept o karma sannyasa is to live life fully, to participate in all events externally while internally maintaining an attitude of non-doership. Explaining how closely attachment, desire and ambition govern our lives, Karma Sannyasa describes methods to transform these patterns and realize a happier outlook through the blossoming of spiritual awareness. 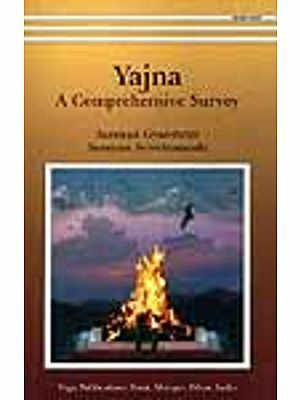 This book focuses on the guru-disciple relationship, family life and relationships, karma, self - respect and lifestyle, describing the process of realizing spirituality through everyday experiences. "I have come a long way to speak to you," the newcomer said. He was an artist, a painter. He had long hair and delicate hands. Although he spoke slowly and carefully, measuring every word, there was a note of restlessness in his voice. There were several other people in the room. They had come to carryon a conversation started a few days earlier on the meaning and purpose of life. The artist was a newcomer and he had come alone. With a slight hesitation, he began to speak. "In my life there has been the normal share of ups and downs. I have participated fully in every sphere of life and really I have no reason to complain. But, nevertheless, I feel that there is something that I have missed out on. I have begun to question my existence and my relationship with others. I feel an inadequacy of purpose in my life. 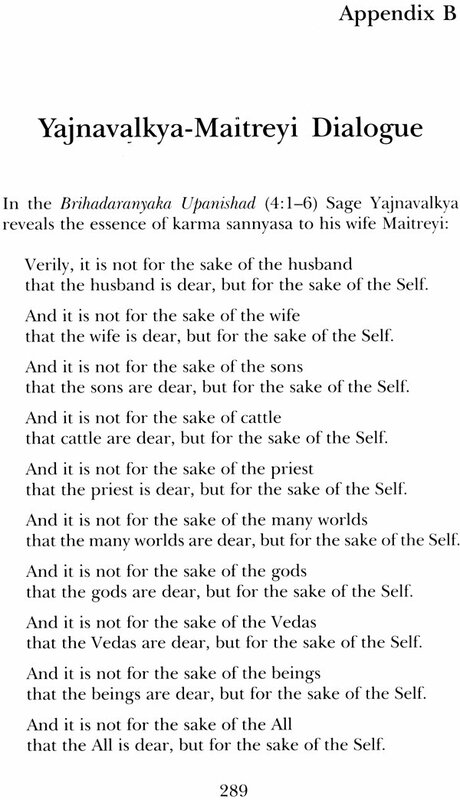 I have often contemplated sannyasa, but I have a family to look after. I am not yet free of that responsibility, yet, at the same time, I wish to give my life a new impetus, a new direction and a new goal. "I would like to embark on a spiritual quest, but as a married man with obligations and responsibilities, it seems that all the doors are closed to me. Or is there a way out? You see, if this realization had dawned on me earlier, I would not have burdened myself with family and social commitments. But is it too late now? Where can I start?" He paused, searching for an answer. He looked young in years, and was dressed simply with an air of casualness. Swamiji looked directly at him and replied, "There is a solution to every problem. We have only to find a way out. You see, man is born, he grows into an adult, gets married, earns a living, grows old and dies. This is what is happening everywhere. But can we believe that this is the sole purpose for which we live? "Of course, there are many important factors which determine one's life. You are born with certain karmas and samskara and have to work them out before you can proceed on your life's journey. But what is the use of working out one set of karma and, at the same time, building up another set to influence your future life? "Therefore, you have to approach life with great care, proper understanding and a desire to achieve a better quality of existence. I have met many people of your age, and also older, who were faced with the same problem. They wanted to improve the quality of their life. 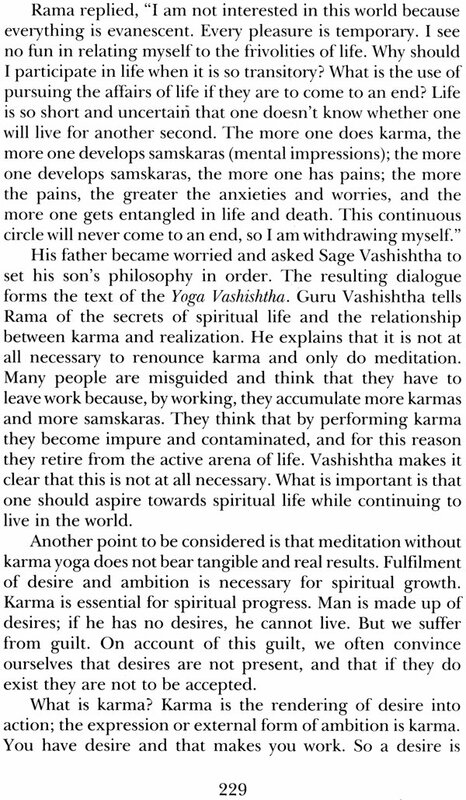 Many thought that sannyasa was the answer, but they were unable to adopt that way of life, for they were tied down by responsibilities which they had yet to work through. It seems pointless to abandon your responsibilities and then be ridden with guilt for the rest of your life." Outside the sky was dense with clouds. It had rained the night before and the air was fragrant with the smell of the wet earth. Swamiji continued, "I feel that if you view life in the right perspective and make certain adjustments in your thinking, then you will find a solution to your problem. The problem you describe is actually simple. In fact, I even hesitate to call it a problem. "Your thirst for the mundane experiences of life is more or less quenched. Your awareness is now growing to another dimension of experience. That experience is related to your evolvement - you may call it mental evolvement, spiritual evolvement or evolvement of consciousness. This has caused a restlessness in your being, for you are not able to adjust or understand how to combine and synthesize your everyday life with a higher, more meaningful existence. "I have given a great deal of thought to this problem. How is it possible to live the life of a householder and yet maintain a balance between one's external and internal growth? It is for this reason that I have reinterpreted the vanaprastha ashrama and adapted it to suit the needs of modern men and women. In the olden days when a house- holder, or grihastha, felt the need to delve deeper into the mysteries of life, he undertook the vanaprastha ashrama, retiring to the forest with his wife to spend time in contemplation and inner reflection. 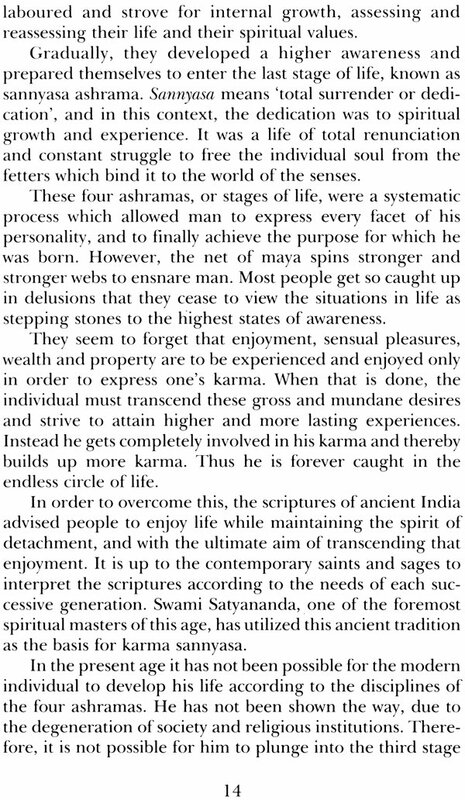 "The vanaprastha ashrama was devised by the saints and sages who could envisage that once man had exhausted his ambitions, passions and desires, he would undoubtedly turn inwards. 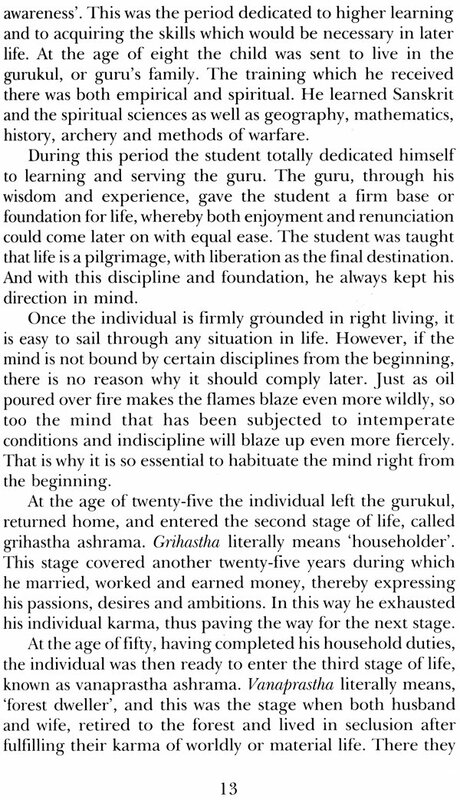 If, at that time, he is not given the facility, guidance and encouragement to understand his life better, he will develop mental and physical problems, and thus become a hindrance to both himself and society. "However, in today's world, there are no forests in which to live, and it is not practical or even possible to create that situation. 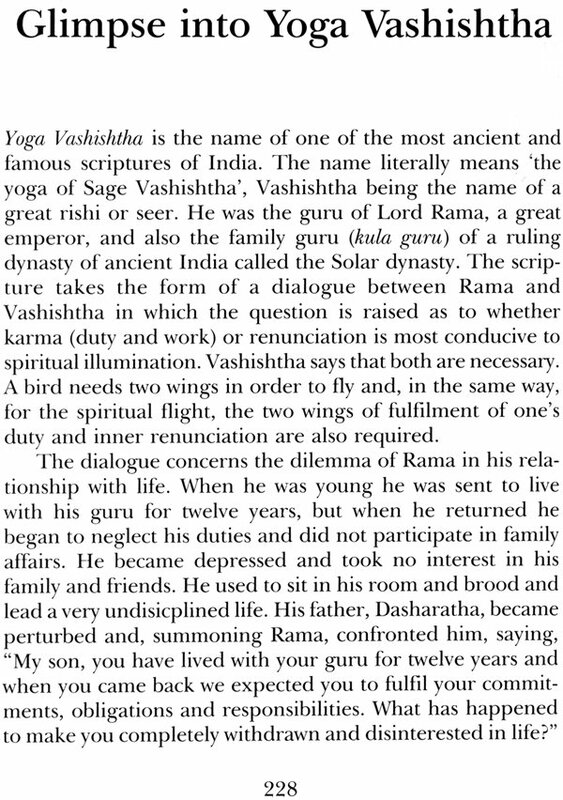 So I have introduced the concept of karma sannyasa based on the tradition of vanaprastha ashrama. Many people have already been initiated by me. They had similar problems to you, and were of all age groups, married and single. 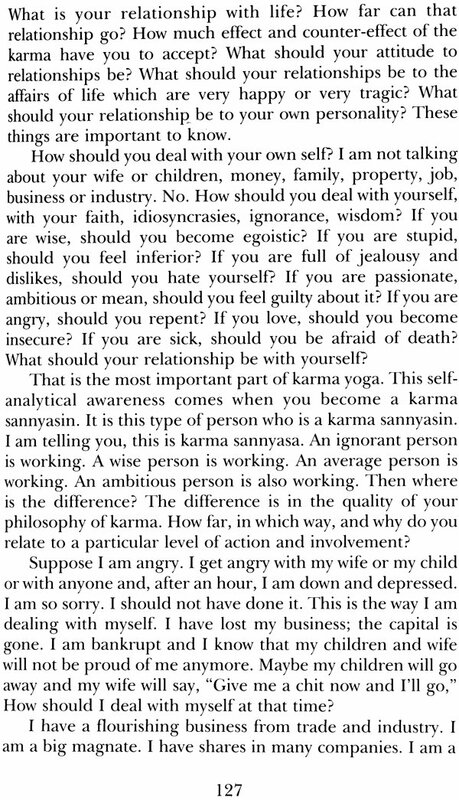 Karma sannyasa has worked very well. In fact, wherever I go there are many people who ask for karma sannyasa initiation." The artist, who had been listening intently to every word, asked Swamiji, "What is karma sannyasa and how do you become a karma sannyasin?" Swamiji replied, "Karma sannyasa is 'inaction in action'. 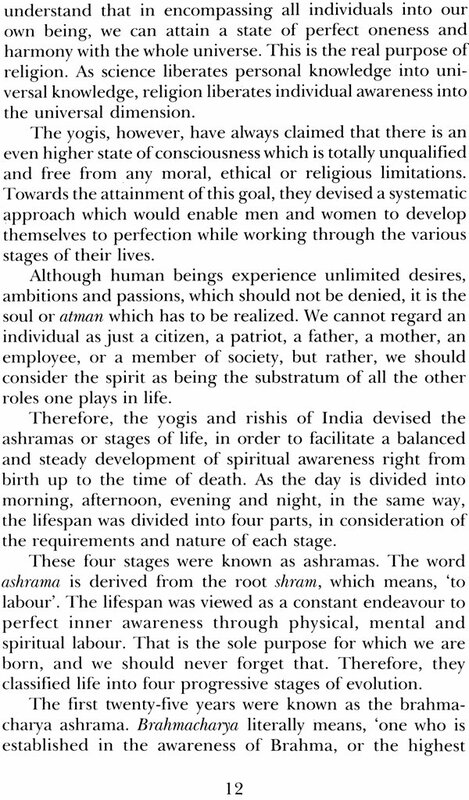 This is the principal philosophy of the Bhagavad Gita. 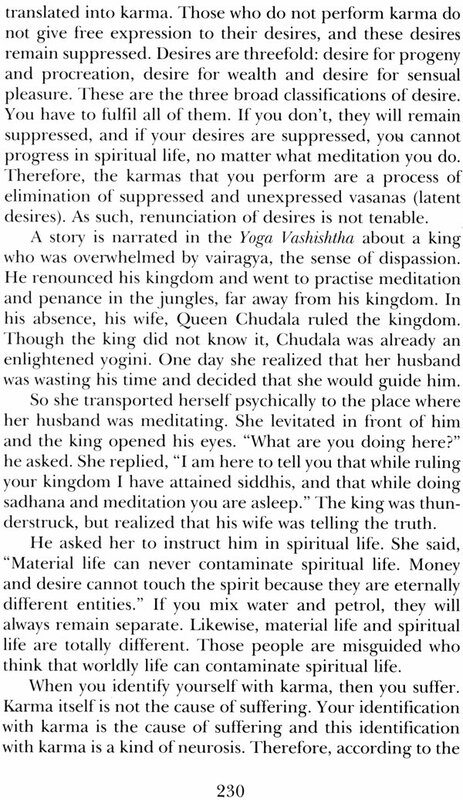 Krishna tells Arjuna there is no harm in action, the danger lies in attachment and dependence on the fruits of the actions you have performed. The wise man, even while acting in this world, is not interested in the fruits of his actions. The sense of doership, which gives rise to happiness and unhappiness, is fictitious. "You are not the doer of any action," he tells Arjuna, "so why do you assume doership? 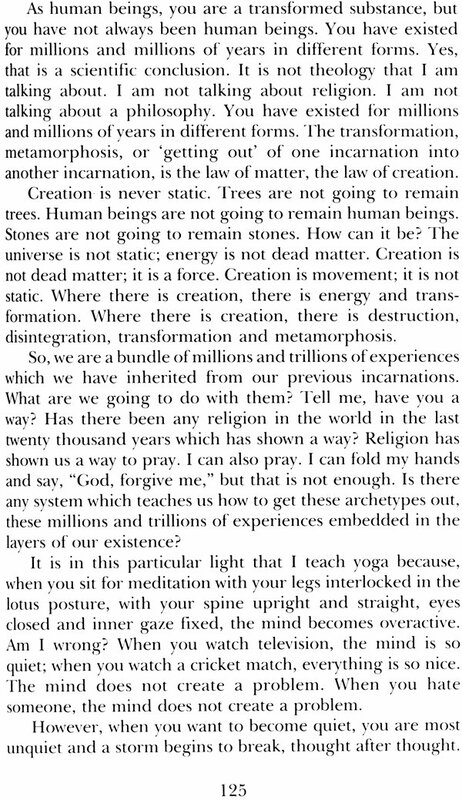 "; the Gita explains this concept. "If you can understand this concept and implement it in your daily life, you will gradually have a higher quality of experience. 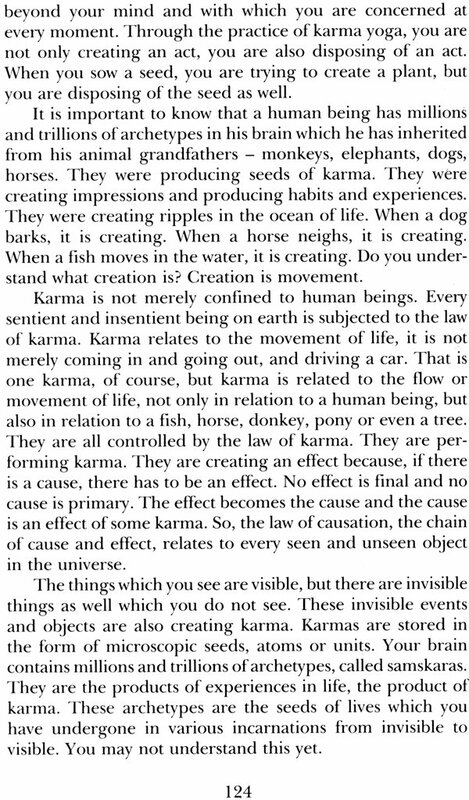 That is essentially the philosophy of karma sannyasa. Live life fully, participate in all events externally, but internally maintain an attitude of non-doership. Do not become inactive, for you will gain nothing. What has to be done, has to be done. Even while doing the actions natural to you, you are truly the non-doer if you are unattached to them. On the other hand, if you are doing nothing and are attached to that non-doership, you become the doer. 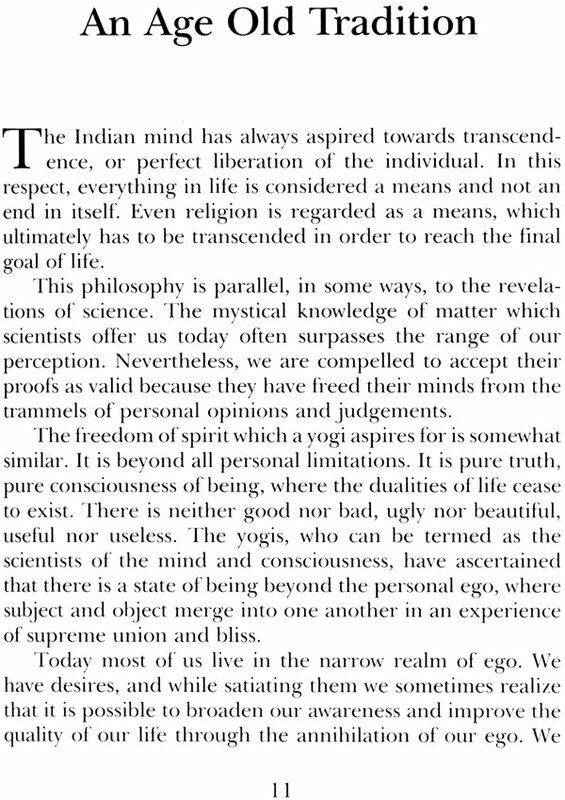 "It is a very intricate philosophy and has to be understood in its true light. The change I am talking about is internal. Your external life goes on as it is. You live with your family, work, go on holidays, see movies. In fact, on the outside you should appear to be the same person. But internally you will have to do a lot of overhauling. All the changes that are taking place are within you, not outside. Of course, it does not happen overnight, it is a gradual process, but once you are able to grasp the significance of this idea in relation to your life and growth as an individual, you will find the answer to your problem." The artist remained silent, pondering deeply on what had been said. 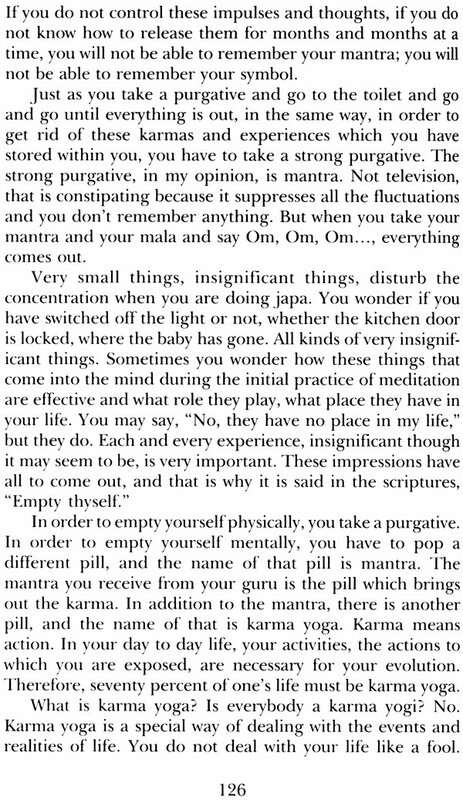 At that point a lady, who had been attending many satsangs, and was herself in search of a new way of life, asked Swamiji, "What is the necessity of initiation into karma sannyasa? If we are to maintain our external appearance, relationships and lifestyle as they are, is it not possible to achieve this inner attitude without being initiated into karma sannyasa?"